Is it possible to make lotions without preservatives? It is very possible to make a water-based lotion without preservatives, but it isn’t going to last very long. Within a few weeks (or less) it can start growing mold and bacteria (like I had happen here, pretty scary, right?). Properly using a preservative ensures that your lotion will not grow bacteria or mold and will last as long as the oil with the shortest shelf life. Check last week’s Talk It Out Tuesday where I discussed the importance of using preservatives. If you don’t want to use a preservative, you’ll want to stick with just an oil + wax based balm and skip the water part of your lotion. What are the different types of lotions out there? Like I mentioned above, there are so many products that can fall under the umbrella of lotions, because they are skin-care products that are used to soothe dry skin. Below are some of my favorite lotion-type recipes! Help! My lotion is super greasy and I don’t know how to fix it! 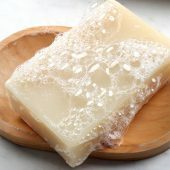 Have you ever made a batch of lotion or balm and found it to be a little too greasy for your tastes? Don’t throw it away yet, you can save it! For many people, lotions/body butters can give that greasy feeling that can just feel a little off to them. 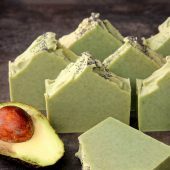 But, there is a simple way to prevent that, try adding tapioca powder to your lotion recipe, it helps cuts down on that greasy feeling and gives your final product a silky smooth feeling. Start at 1 tsp per pound of oils. You can always add more but you can’t take it out. If you’ve made a water-based lotion and don’t want to use tapioca powder, you can increase the water and decrease the liquid oils to see if that solves the greasy feeling for you. In simple terms, an emulsifier is a product that binds the water and oils (naturally, water and oils do not mix together). Without an emulsifier the water and oils in your lotion would eventually separate. 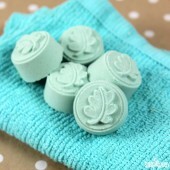 To get your lotion recipes to work, you will need to add some type of emulsifying wax. Bramble Berry sells two different types of emulsifiers (either of which will work great in your recipes), PolaWax Emulsifying Wax or it’s generic counterpart Emulsifying Wax NF. Bramble Berry also sells BTMS-50, which is a conditioning emulsifier that leaves a slightly more silky feel to lotions (and can be used as a hair conditioner emulsifier). It is a common urban myth that Xantham Gum/Beeswax emulsifies into something resembling lotion, but I can tell you from experience that it doesn’t do a great job. It may emulsify but it’s not very stable. From a usage perspective, it’s not ideal in my opinion. It dries in sheets on your skin and you can peel it off, rather than absorb in. Unfortunately, we have not found an all natural emulsification system that is stable for commercial use (and we’ve tested them all). What can I use to color my lotions with? We have always had the best luck with our LabColors. 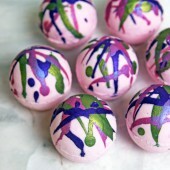 They give that gorgeous color and stay really well in your lotions and body butters. If you haven’t used them before, check out this post to find out how to dilute and use them. 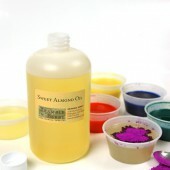 You can use any water soluble colorant (so long as it’s food or cosmetic grade) or many micas. 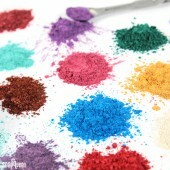 Oxides and pigments don’t work great as they are oil-soluble and can leave skin streaky with color. How do I label my lotions? You also need to include your business name, your business address and the net weight in fluid ounces – example: 6 fl. oz / 180 ml. For more information on labeling your lotion, check out this handy-dandy guide to labeling your lotions or buy the (awesome awesome!!!) 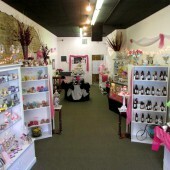 book by Marie Gale on labeling your products here. We’d love to hear your comments about your experiences making lotions and any burning questions you have about making lotions. Oh no, that’s frustrating! I would scroll to the bottom of the email and see if there is any kind of ‘unsubscribe’ link. I’ll check with our IT team to see if there is a way to do it from our end too! Can I first apologise for posting here about something that is not truly lotion-related but I’m not sure where I can post this. I have a question about anhydrous whipped body butters and adding stearic acid. What percentage rates are recommended? 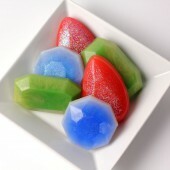 I am wanting to take some with me to the Caribbean! Please coujld you advise? Adding Stearic Acid to your lotion acts as a thickening agent. Usually body butters are quite thick themselves, but if you’d like it even thicker, I would recommend using it at 1-3% of your recipe. 🙂 Have fun in the Caribbean! Is there a way of making lotion less greasy without dryflo? The lotion I make can leave a sheen of oil but is absorbed after a few minutes, so I don’t want to drastically change it, but slightly. How would I tweak this? Add more water? Less oil? I use the same recipe as my above comment. Sorry for the delayed response, somehow I missed your comments! If you feel your lotion is too oily, I would recommend using slightly less oil in your recipe :). I hope this helps! and it usually makes about 4 1/2-5 4oz bottles of lotion, if I wanted to add evening primerose extract, and calendula extract, would I need to alter my preservative or any other ingredients, or can I just add in what I want and not add anymore water? If I added DT Panthenol, would that effect anything as well? Does Brambleberry offer any other extracts or oils that could help with eczema? Good question. All of Bramble Berry’s extracts are oil soluble, so if they were added to your recipe, you would not need to add more preservative. Adding DL-Panthenol would provide some extra skin loving properties and would not require extra preservative. I think the extracts you chose are good ones! Some other good options would be Mallow Extract, Buckthorn extract or Aloe Extract! Hi, Is there a way to thicken a cream up that came out too think? 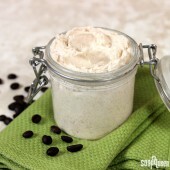 Hey, I was wondering if anyone has tried using coffee butter instead of shea butter in your lotion recipe? 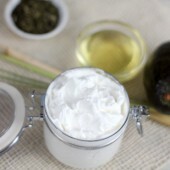 I know how good it is for your skin and use it for our body butter recipe. It would certainly increase the cost but I would like to try it. Thought I would ask everyone before I did it in search of some good advice. Thank you! I notice that most recipes are in oz, but I’m from the UK and only use grams! Do I just use google to convert the recipes on SQ? I have been told that measuring in grams is more accurate than ounces. Additionally, I am afro-Caribbean and use store bought water-based conditioning butters on my dry hair. I am thinking of using the recipe in my hair but concerned about putting stearic acid on my hair. Can you please advise? Yes, I would simply convert the ounces to grams :). The recipe above is technically a lotion recipe for the body, so I’m not 100% sure how it feel on the hair. If you are planning on using the mixture on the ends of your hair, I might recommend using a small amount of Coconut Oil, or Jojoba Oil. I simply warm up a very small amount of the oil in my fingers, and place in on the ends of my hair. It helps smooth and moisturize :). 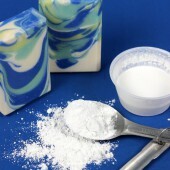 Stearic Acid is traditionally used as a thickening agent in lotion and is also used as a hardening agent in soaps. I don’t see it causing any issues :). Did you mean adding the coconut to the recipe? I actually just apply a teeny tiny bit of oil straight to the ends of my hair! Just a personal trick of mine :). Are you looking for a hair smoothing product to leave on, or wash out like conditioner? Anyone not like the “greasy” or “oily” feeling of going natural? 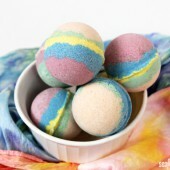 Try applying in the shower after washing, and a light rinse. Tie long hair up first and make sure to have tub grippies or a tub mat for anti-slip (the oils can make the shower floor a bit slick), towel or air dry as usual. I LOVE this method and when it’s just before bed I wake with baby soft, moisturized skin! 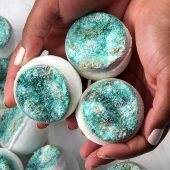 Tip: Lavender & Vanilla essential oils are a great combo for a bedtime shower…so relaxing, and I sleep like a baby =), Peppermint & Vanilla are a great morning combo for a refreshing pick me up! Hi! I was wondering witch is the best preservative to use in this recipe……Optiphen, Optiphen Plus, or Optiphen ND? You have a few options when choosing a preservative for this recipe. Because it contains water, I would recommend a water soluble preservative, like Optiphen Plus or Optiphen ND. For more information on your preservative options, you may find this post helpful! Thank you for responding so quickly!!! I really appreciate it! I’m still a bit confused. The way I understand it from that post is that Optiphen can be used in solutions containing water.However, you recommended that I use Optiphen Plus or Optiphen ND. I have also read that somewhere else. Would Optiphen work in this recipe? What are some other examples for how I would use Optiphen. I purchased both Optiphen and Optiphen Plus. I have a few different lotion recipes I use and would hate to waste the Optiphen and not be able to use it. Thank you!! I make a shea butter cream to help with my ezcema, lately I have been having a probelm getting the aloe to mix, consequently when it sets their are watery pockets. I have used liquid aloe, gel aloe, and tried extracting aloe directly from the leaf. Same result, grrr frustrating! Anybody have any suggestions? Thanks! Just keep whipping! 🙂 My suggestion would be to use a little less aloe and whipping it a little longer using a mixer/blender. Hope this helps! I made lotion from my own recipe today for the first time from scratch. It smells so good. I tried it it was not greasy that’s good but when you first apply into your skin it was kind of sticky. After a while it is feels smoother. I used preservative supposed to be .75 ounces and by mistake I put 1 ounce. The same mistake i did when I put the fragrance oil. I supposed to put in the recipe 1.5 ounces and I put 2 ounces. I also put 3 tbsp. of honey. Any advise on this to make a better lotion next time around. I have been making this lotion recipe and LOVE it. I have used shea butter, cocoa butter and mango butter. Wondering if you can also switch out this butter for coffee or avocado butter? Just wondering before I experiment with a batch. I have used your recipe for thinning out and worked out beautifully. I also adjusted the stearic acid and it is a charmer. THANKS! Hello, I made a cotton candy body butter for a friend. I used shea butter coconut oil and a cotton candy fo. I also added cornstarch to reduce greasiness. My frien said that the butters scent wasnt strong enough. For 8 oz I used a bit under 1oz of f.o. like myself , she prefers butters to have a heavy scent that are long lasting. What’s a good amount of fo to heavily scent 16oz of body butter? Does cornstarch. Interfere with the fo? 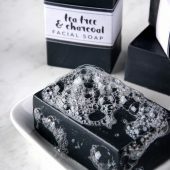 Are there any natural additivesthat prolong the scent once it comes in contact with the skin? Typical usage rate for fragrance oils in lotions and butters is about 1%, so you’re already way above that if you’re using 1 oz per 8 oz of butter. Any of Bramble Berry’s fragrance oils can be used at up to 5%, but you’ll want to check with your vendor to see what the maximum usage rate is for your cotton candy fragrance. If you have room to increase your usage rate, then you can. Cornstarch shouldn’t have an effect on the scent of your butter. To my knowledge, there isn’t a natural additive that prolongs the scent on the skin. Is it possible that you just need a stronger fragrance oil? I’m concerned that it’s not strong enough when you’re using it at almost 12%, which is way higher than is typically necessary. Are you using refined Shea Butter? The natural odor of Shea Butter could be interfering if you’re using unrefined. Wondering about sanitizing bottles. I do soak in bleach water for about 10-15 minutes and let air dry on paper towels. This is my least favorite part because I always forget until I am ready to make lotion and then have to do this and I don’t get to start for quite some time. I have been wiping inside with paper towel around chop stick to be sure it is completely dry. I am being a little excessive? Would not the phenonip in the lotion take care of any problem? Just wondering. Thanks. 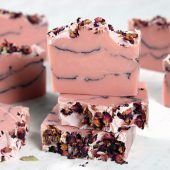 Hi, I have made this recipe before and loved it, now I would like to use this recipe and use two different scents,can I split the batch and scent it separatly? If so,would I first add the preservative to the whole batch then split or add it after spliting? Thanks Becky, as always you are such great help! 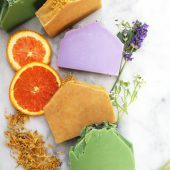 I do have one more question, if I want to add two different scents to a lotion batch or soap batch how much fragrance do I add,do I add half and half of what the fragrance calculator says of each fragrance? 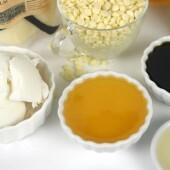 Our general usage rate for use of fragrance oils in lotion is .2 ounces per pound of lotion base. As long as your fragrances don’t go above that amount, you will be just fine to add however many you would like! For example, you could add .1 Fresh Bamboo Fragrance Oil and .1 ounce Amazon Lilly & Rain Fragrance Oil to a one pound batch of lotion. I see some people have wanted to thin out the lotion by adding more water. I too want to try thinning it out and was just thinking of cutting back on the stearic acid a bit? Would that not work? It seemed more obvious to me than adding more water because the stearic acid is what does the thickening? Please advise. Thanks. If you are finding that your lotion formulations are a bit too thick, you can add extra water to help thin them out. Just make sure you adjust your preservative if you are adding extra ingredients to your batch. You can also cut back on the Stearic Acid as well. It is really up to you and we encourage you to experiment in small batches to find out what kind of ratios work the best for you. Hi! I have a little dilemma. 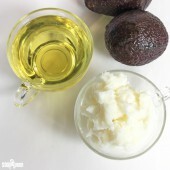 I want to make a thick thick rich body butter with water all the recipes I have come across are more like a thick cream. I want it to be the consistancy of body butter with no water but have water. I know it is possible I see many out there but no recipes! =( Do you have any suggestions to help me out? Also have a question about lip balm but don’t know where else to ask?? I have been making and it seems to be cracky and chunks out sometimes. Am I dong something wrong?? Also one time had bubbles in it and it was painful to rub on lips. Why does that happen sometimes? With our recipe, we haven’t noticed any cracking or chunks, did you add anything extra to it? The easiest way to tell the final and end consistency of your lip balms is to use the frozen spoon trick. 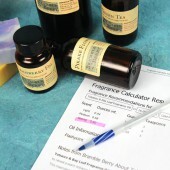 With your particular recipe, are you adding any fragrance or essential oils? You will always want to make sure you are adding lip-safe essential or flavoring oils in your lip balms. I finally tried making your lotion recipe with rosewater and distilled water along with some rose essential oil and it is very pretty. 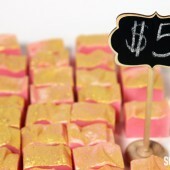 Too expensive because rosewater is pricy but will make great gifts for the ones I love! How long have you experienced do they stay good? I have used the phenonip for the preservative. Thank you for responding. It wasn’t very helpful though, for me anyway. Maybe it would be for someone with experience in using preservatives. I am just confused on the percentages. I have no idea how to convert it. I can weigh my ingredients, that’s no problem, but once I get to that point I have no idea where to go after that. I don’t know how to convert the preservatives into weight. I was hoping you could help. Thank you for your time. 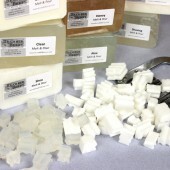 2 oz of e-emulsifying wax. If you wanted to get the preservative rate for this recipe, you would add the entire thing up to get the weight, which in this case would be 14 ounces. Once you’ve gotten the weight, you would decided what amount of preservative you want to use. In the case of Optiphen Plus, it is a 0.75 – 1.5% usage rate. I usually like to go in the middle at a 1% usage rate. All you need to do, is type into Google ‘What is 1% of 14 ounces’ and the Google calculator will come up with your answer. For this particular recipe it would be 4 grams (.14 ounces). Google has become my best friend when trying to work with percentages and I’ve found it to be a great tool! I want it thinner – EXACTLY how much water? Start with more or add after it is done? I want it less greasy – EXACTLY how much tapioca powder for THIS recipe? Do I need more preservative to be safe in selling it? EXACTLY how much for THIS recipe? Do I need vitamin e as well? 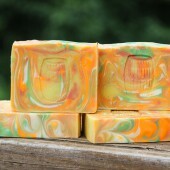 I am great at soap, I seem to be a lotion dummy – please help a lotion dummy out! Thanks! We are excited that you are trying out our lotion recipe! If you don’t already have our How to Make Lotion Booklet, I would definitely suggest getting it as it has so many helpful hints and tips on making your own lotion. If you are looking to thin out a recipe, we like to stick around the 5% – 10% dilution rate, it’s totally up to you on how much you choose to dilute it (within those percentages). 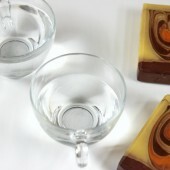 You would want to start with more water at the beginning if you were planning on making it thinner. If you were to add it in after you had already made it, you would have to re-emulsify it as well as adding extra preservative. If you are finding that your lotion recipe is a bit too greasy for your liking, we like to use Tapioca Powder at a rate of 1 teaspoon per pound of lotion base. For the recipe you have listed above (without any changes), that would be about 1 1/2 teaspoons of Tapioca Powder. If you are selling a lotion product that contains water, we highly suggest using a preservative to prevent any microbes, mold or bacteria from growing in your product (you definitely wouldn’t want those to start growing in a product if you were selling it). The preservative amount actually depends on what your final yield is. If you were to go by the recipe above (without any additional water), you could use Phenonip at a .5 -1.0% usage rate or you could use Germaben at .3 to 1.0% usage rate. Vitamin E is not needed in a recipe, but is a great anti-oxidant to add to any of your lotion recipes. 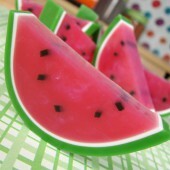 Plus, it is really easy to incorporate into your recipe. It’s very basic, but it makes a wonderful lotion. When working with preservatives, you will always want to make sure your recipe is by weight (ounces) and not by volume. Doing this will ensure that you are using the precise amount of preservative in your product so that you can protect it from bacteria and mold. For your particular recipe, since it is mostly water based, I would suggest using the Optiphen Plus (water soluble) at a 0.75 – 1.5% usage rate. Do you have to have your lotions lab tested? They are expensive. Will the preservative be good enough? All our lotion bases on Bramble Berry’s website (Aloe & Beeswax) are batch tested to ensure that they meet the standards and do not grow any mold, bacteria or microbes. 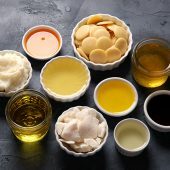 You do not have to get your lotions lab tested, but it is definitely a good idea when you are first starting out to make sure that the preservative you are using is working with your specific recipe. If I substitute a preserved Aloe Vera juice (preserved with citric acid and sodium benzoate) for water in a lotion do I still need an additional preservative if my other ingredients are only butters, oils and wax? Even if the Aloe Vera Juice has a preservative in it, it is only sufficient enough to preserve the Aloe Vera Juice and not any additional ingredients that you would add to the product. We would recommend a good broad-spectrum preservative like Phenonip in your batch at .5%, which is the low end of the the usage rate if your aloe already has a preservative in it. I would also confirm with the vendor that you purchased the Aloe Vera Juice from to make sure that the aloe does have that preservative in it or not — just to 100% safe. If it doesn’t have it in it, I would go ahead and use the full usage rate for any preservative. 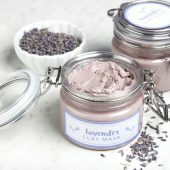 Any help you can give on some of the night creams and body butters melting in the heat during the summer at craft fairs. Are there any ingredients that would make it more stable. I NEED HELP!! Do you HAVE to use distilled water? Why or why not? I live a couple hours away from town and have everything except the distilled water to make lotion… Just don’t want to make a failed batch if I ABSOLUTELY need the distilled H20! THANKS! 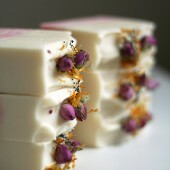 I’m interested in making a shower lotion. You can apply it in the shower and then rinse off. 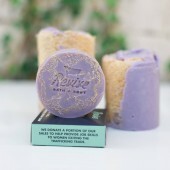 It leaves your skin soft and smelling nice. Do you have a recipe for a lotion like this? OK, lotion using your recipe works great. Have not been able to find any other recipes. Can you suggest where to find some? Can you just switch out the oils and butters for any others? Afraid to start playing, if you know of any that DON’T work, please let me know. Would love to find more recipes. Oh and used 9oz.distilled water/9 oz.goat milk and it came out just fine:)Thanks. 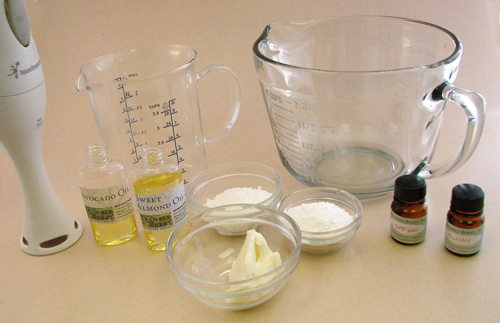 When making lotions, you can substitute different oils and butters for what the recipe calls for. I’d definitely suggest making smaller test batches if you are just starting out so you can find out what works the best for you. Can you use rosewater to substitute in your lotion recipe? Just tried my first batch using the basic recipe on Brambleberry and was nervous because after using stick blender for about 3-4 minutes it appeared to still be liquidy! Poured into my bottles and realized it had thickened up some because the residue was creamy,my only question is, while mixing it got pretty foamy. When I poured my bottles have foamy tops. Should that be scraped off the top first or am I doing something wrong and it should not be foamy? Oh, I used the recipe with goats milk. (9 oz. water/9 oz. pasteurized goat milk). Thanks! 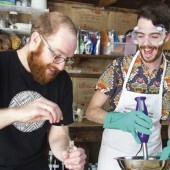 We are so excited that you are starting to make lotions, you are going to have so much fun! When you make a lotion, it is totally normal to have a foamy top and that will disappear over time. We haven’t found a goat’s milk lotion recipe that has worked out for us, but we are excited to hear how yours turns out, keep us updated! I use the above recipe with 1 oz sweet almond oil. 1.2 oz evoo, and 1.7 oz olive oil. Instead of water I use 18oz of aloe Vera juice. btw i find this recipe helps tremendously with my eczema and my friends psoriasis. and yes I made sure it wasn’t beeswax. and I agree that they look similar. I wonder if the aloe and oils weren’t close enough in temperature? or maybe I mixed them too fast? 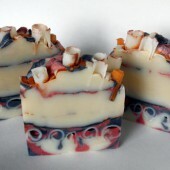 This batch wasn’t good enough to sell or give as gifts but it will keep my skin happy. I also added more phenophip because I was afraid the reheating would kill it. I hate to make the same mistake again and wreck an awesome lotion. 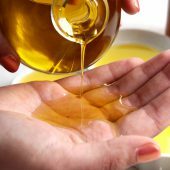 On the oils that you are using (the EVOO and OO) are the an addition to the recipe or a replacement? If they are a replacement to the Shea Butter, they are going to be the perfect substitution since Shea Butter is a semi-solid. I’d also try upping your e-wax by 1% in the recipe to see if that helps. How are you mixing your lotion? 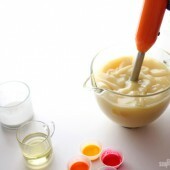 We’d suggest using a stick blender as we have found that it really helps in lotion-making. I hope this helps! I made a batch of lotion using my usual recipe and it did not emulsify this time. I saved it by reheating and adding more oil and e-wax. How do I figure out what went wrong? Ive used this recipe many times with wonderful success. Do you have a recipe for self or sunless tanning lotion? so is dry flo the same as tapioca powder? Can I use Arrowroot instead? Which one is better at fixing the greasy feeling? I am having major problems with my hand creams. They are hard instead of being creamy. They seemed to be to greasy so I did use dry flo. But, I can’t figure out why all of a sudden I am having major problems>>>>>>>>>>>>>>>>HELP!!!!!! Hi, I have a question about preservatives. 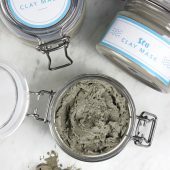 I’ve been making soap and body butters for almost a year, but have been hesitant to start with lotions for the limited availability of preservatives in my area (Asia). I found out that some local manufacturers use sodium benzoate and phenoxyethanol in their creams and lotions. Would this be an okay option before considering ordering online? If so, how much preservative should I use and what would be the shelf life of the lotions? Since Bramble Berry doesn’t sell that particular combination of products, that preservative system is something I am not an expert in. 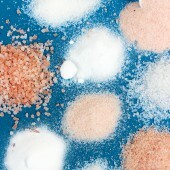 However, sodium benzoate really only works best at pH levels below 6. Your cream will have a higher pH level than that. So, it won’t be very effective for you in creams I fear. 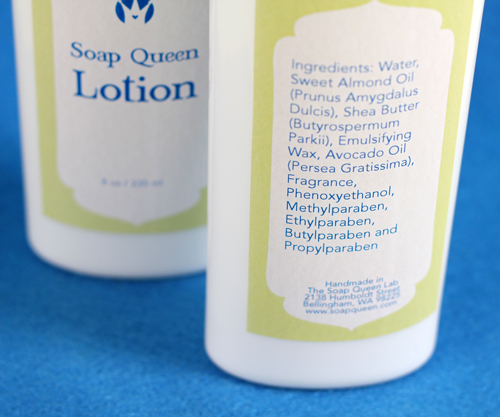 Phenoxyethanol is an excellent preservative system and is typically used at 1% for lotions and creams. Whenever I make a new lotion formulation, I always send it to a lab to test that my preservative system is doing it’s job. In the US, this is called a ‘Challenge Test.’ I would urge you to seek something out like that in your area if you are unsure of the preservative system you are using to ensure that the products you make are safe, for you, your friends and any customers you have. Bramble Berry does ship internationally, and we are more than happy to ship any of our preservatives to you. 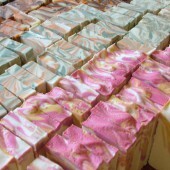 Or, you can also buy from Aussie Soap Supplies (located in Australia) which does sell some of Bramble Berry’s products. 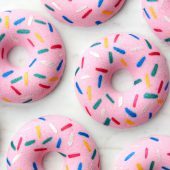 Hi, I have a question regarding emulsifiers. I’ve been using vitamin E oil daily for a damaged area on my skin and recently I started experimenting by adding pure aloevera juice which is %99 pure and used for drinking and adding a few drops into the bottle of vitamin E oil, however the liquid and oil don’t seems to mix. So my question is: I want to use an emulsifier but I want something quick and easy, something i can find around the house, so i was thinking what if i add a few drops any ‘premade hand or facial creams” that already contains an emulsifier in it? So if I add a store bought lotion into the aleovera and vitamin E can that act as an emulsifying agent to help bind the two? Thanks for the question. I bet the Vitamin E is lovely on your skin. And Aloe Vera also has some great skin properties associated with it. You’re right – they don’t mix though. Aloe Vera is water soluble so trying to mix the two is like mixing oil and water and you’re correct, you do need an emulsifier for that. Sometimes lotion and emulsifiers can be a bit tricky but we are here to help you out. When using an emulsifier, you do need to use it at the time of creating your product (as everything is melted at that point) and if you try to mix in a premade product it might not actually emulsify (blend) your Vitamin E Oil, Aloe Vera and cream. 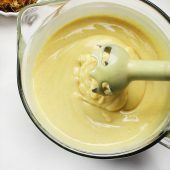 This is because most emulsifiers are used at 3-8% of the total recipe so if you change the recipe in any dramatic amount, the emulsifier won’t work. In addition to that, any preservative in the cream may not be able to handle the extra ingredients you’re putting in. So, if you try this, please only try a small amount and maybe consider still keeping the mixture in the fridge for the preservative’s sake, just to be on the safe side! Thank you so much for your advice. Now I understand why a premade lotion is unlikely to work as an emulsifier, your explanation made perfect sense. Thanks again. Wishing you all the best. Thank you so much for your informative, detailed and honest dialogue on throughout your site, as I never would have imagined that making items of this caliber could be so easy!! 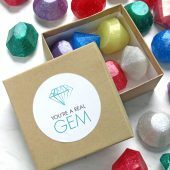 Thank you immensely, as I am already preparing an order! I admire your honesty and openness! I just got avocado butter,coco and sea butter . I was wondering where should I keep this products? P.S. Can’t wait to hear about your soaping adventures. Keep us updated! I want to try your lotion recipe but I am not sure how to measure out the .2 oz of preservative, can you help me out? My scale does not go down to .2 oz. 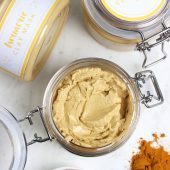 Can I use lecithin instead of bees wax while making lotion? 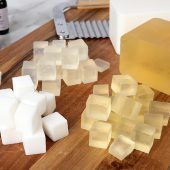 Unfortunately, the lecithin is not interchangeable for the beeswax while making lotion and you will need it in this recipe. Can you tell us the best way to make this recipe thinner. is it with more water or oil or less wax? Found this recipe almost to thick to squeeze out if a bottle. Violet, did you receive an answer to your question on how to make it thinner? Good afternoon, Steve! If you are looking to thin this particular recipe out, all you would need to do is dilute it with water. We like a 5%-10% dilution rate. P.S. Don’t forget to change the preservative percentages to go along with it! I’m really interested in making self tanning lotion with DHA..It has been almost impossible to find information on this. Do you have any suggestions? Recipes? Thanks! I’ve used it; it works great. 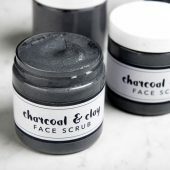 This is where I bought it from: http://www.makingcosmetics.com/Self-Tanners-c35/ They have lots of great info on how to use it too. Hi Fran. Are you still using the BB pre-made lotions and how do you/ your customers like it? 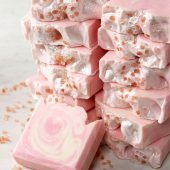 I ordered premade lotion and fragrance oil from BB, and I want to know if there is anything special I need to do to (other than measure and mix) before I add the fragrance oil to the lotion. 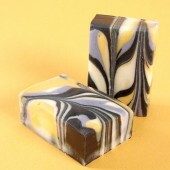 And could I add fragrance oil to an already made plain liquid soap? Thanks for your time and all your information online. 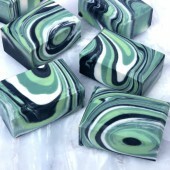 I love reading about and making CP soap. Although, I have never had anyone in the kitchen to show me how, I have watched you and spent lots of time reading. 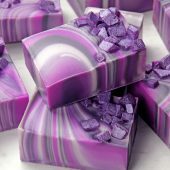 I have been making CP soaps for almost a year, very successfully! Hi Anne-Marie. I’m a little worried about the statement that non-preserved lotions could last a few months. I wouldn’t suggest that anyone use a non-preserved lotion a week after its creation date as there are so many things that can get into our lotions that we can’t see. 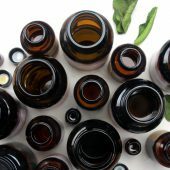 It’s not possible for us to create a sterile environment in our workshops for our products, so we’re already starting out with a deficit, and the type of bottle we use has a huge impact on the contamination of our products. It’s easy for airborne yeast to get into our products or someone could stick a finger into the product and it’s contaminated. I really appreciate the suggestion that if one doesn’t wish to use preservatives, then anhydrous products are the way to go. 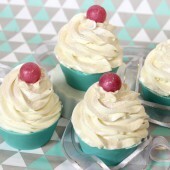 There are so many lovely whipped butters and balms we can make without water! There is a great video showing contamination in lotions at http://www.cosmeticsinfovideo.org/ – make sure you click on The Importance of Preservatives to see it. Ick! I 100% agree with you – just because you can’t see it, doesn’t mean that mold isn’t there. Thanks for the video link – I am off to go view it now. 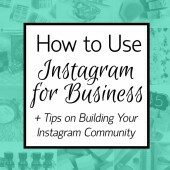 If you’re interested, I host a link up party, Inspire Me Fridays…would love you to link up any of your informative posts for all to see! 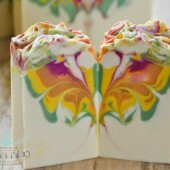 Hi everyone…I am interested in making my own lotions, but I want to use goat’s milk. All of our products are made right on our farm from our own herd…except our lotion. I know using milk is difficult, but I really need some input on this. I just know it can be accomplished. Tips, help, recipes…all would be appreciated. 🙂 Thxs so much! There is nothing inherantly different about milk sitting in a lotion than milk sitting out on the counter. In time, it will spoil. I would recommend putting in 5% milk to your recipe (so decrease water by 5%, include milk) and fully, fully, fully preserve it with (preferably) the granddaddy of preservatives, Germaben II so that you have the best chance of the lotion lasting past 6 months. Even with that, I would put a use-by date of 6 months to be on the safe side. The good news is that spoiled milk doesn’t hurt anyone – it just smells icky – so as long as the product is properly preserved, you’re good to go. The more milk you use, the faster the chance of spoiling (or noticing the smell from the spoilage). 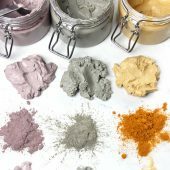 I would love it if you could do a post about all the different additives you can put into lotion, what they do, good usage rates and which of the categories they would go in when making a recipe. Great suggestion – there are so many interesting extracts that you can put in lotions. Typically, they are used at a 1-5% additive rate (generalizing) and are taken out of the water or the liquid oil phase. I love your suggestion; thanks. And, if you let us know your questions about emulsifying, we are more than happy to help you out. I made a lotion with Aloe Vera juice instead of water. It definitely had a preservative used and it’s only been about a month since I made it and have not noticed any mold. Is this a good/safe substitute for water? I’d also like to point out that many berries naturally contain parabens too. The Aloe Vera had preservatives or the lotion had preservative in it? Sorry, I used a preservative in the lotion. 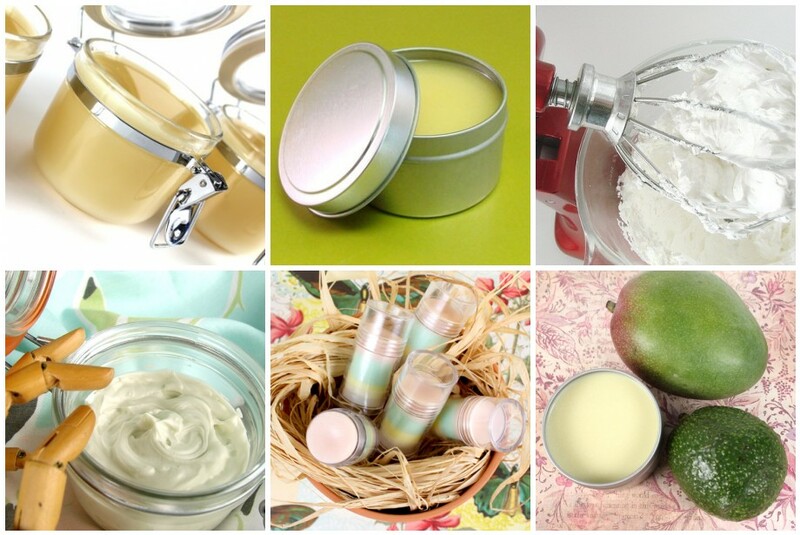 I have made creams with Shea and mango butters with oil and aloe Vera liquid. The aloe Vera liquid had its own preservative. Is that enough or do I still need to add an additional preservative? I’ve tried Olivem 1000 and wasn’t impressed (or else we would carry it – of course, never say never, that could always change). It definitely isn’t a natural product, despite marketing claims (in my opinion). ‘Naturally derived’ certainly sounds better than synthetic, of course, but trying to get an emulsifier through kitchen chemistry with just Olive Oil isn’t going to happen. We used to carry Cetyl Alcohol and found that there wasn’t much of a change between the e-wax and the Cetyl Alcohol so we quit carrying it because there wasn’t enough diffentiation for our customers. 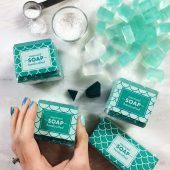 For example, upping the stearic acid be .5% or the e-wax by .5% would increase cream like consistency in your lotions – as would decreasing the water. What is the use/benefit of stearic acid in lotions? Is it a required ingredient? You aren’t required to use Stearic Acid in your lotions, but if you are like me and want thicker (more cream like) lotions, then you are going to want to use it. 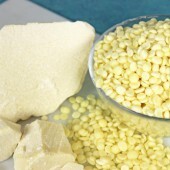 It has traditionally been used in the past as a great thickening agent for lotions and as a hardening agent for soaps! I read this article and the others ones that were linked on here as well. I love all the information you provide on your websites and articles. I don’t personally use any sort of parabens or chemical preservatives in my lotions and I don’t hold it against anyone who does chose to use it. It’s simply a personal choice for me. I just thought I’d offer a few tips on here for others out there who would like to make lotion at home without preservatives. The main thing for me, is that I make small amounts at a time and I use bottles or containers that do NOT require me to have to stick my hands in. I prefer those bottles that sit with the cap upside down so that I can ensure all the product is used up and I only make two 8 ounces bottles of lotion at a time. Since I make just a little bit at time, my family and I usually use it all up within a month or two tops. I also don’t keep the bottles in the bathroom to keep them away from the water, moisture in the air and the heat. I’m not sure if that would work for long term storing or selling but I only make lotion for my family and have been making it preservative free for over a year now with no problems at all. Thanks for taking the time to post such a thoughtful comment. =) You’re right on about your philosophy of safety first when selling. And yes, airless packaging helps with the germ introduction. Most of the ‘naturally preserved’ (I have lots of thoughts about those products) products on the marketplace use airless packaging to help with that extra measure of germ control. Thanks for the great post on lotion! The starting amounts for using DryFlo are missing though. Excellent point – I’ll get that updated. Start at 1 tsp per pound of oils. You can always add more but you can’t take it out. I’d love to see you focus a bit more on environmentally-friendly and healthier ingredients. 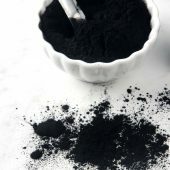 Parabans are known carcinogens, and creating a product that is 80% water wastes a tremendous amount of packaging because more product needs to be used to get any benefit. I’ve been making body butters with only natural oils for years, and I’ve never had a batch go bad. If you leave out the water, you not only save on packaging, but you can omit synthetic emulsifiers and carcinogenic preservatives. 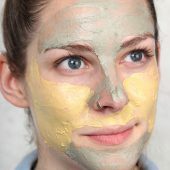 I love your Etsy site – the Clementine Body Lotion/Balm sounds amazing. We’ll have to agree to disagree on if parabens cause cancer (finding parabens in breast cancer tissue does not mean that the paraben caused the breast cancer. At most, the experts who do the studies say there may be a correlation. There is also copious amounts of fat in tumors but no one is saying that olive oil and butter cause tumors). What I suspect we can agree on is that small home crafters make better products than the big guys and that we’re all in for known anti-cancer preventative measures, like exercising more, drinking less and keeping our fruit and veggie intake high. 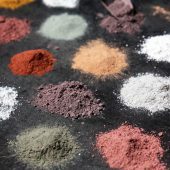 I’m here to help educate on on making traditional products, totally natural products and completely new, out-there ideas – I happily cover it all and am appreciative that I have readers from all walks of life and backgrounds. I’d rather have parabens (which are extremely effective at killing nasty crap) than the nasty crap being slathered all over my skin. Water based/emulsified=less greasy. Less greasy=happy customers (or friends and family). 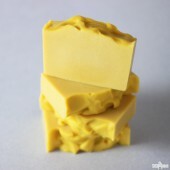 Pure oil/butter creams are find for some things and some people. Not all. Great article on your blog. Read it, tweeted it and appreciated your thoughts on your blog and comment here.